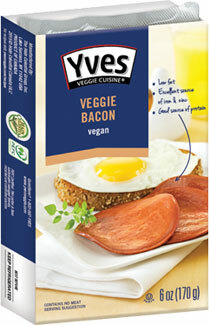 Breakfast takes a new turn with Yves Meatless Canadian Bacon! Pan-fry up a batch for a tasty morning meal, dice it and put it on your favorite vegan pizzas, or pile it on to make a stellar sandwich. Each 6 oz. package contains 9 large pieces of vegan “bacon”. $4.79 per package. From Erica of Belle Vernon, Pennsylvania on 9/16/2018 . These are so good! 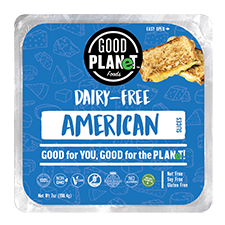 Absolutely perfect for breakfast sandwiches (I use fried tofu seasoned with kala namak and follow your heart american slices) or even bacon cheeseburgers (gardein beefless burgers also with follow your heart american). From Aerialrose of Gainesville, Texas on 3/31/2015 . I always have to buy at least 3 packages at the store. One for myself, one for my husband, and one for my kids. These go in one night, usually within seconds of getting home. 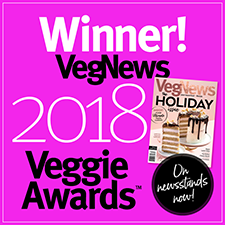 The best part is--it's cruelty-free! And I have a happy mouth and belly. I can't wait to get some more. It's affordable and a special treat. I cook mine for a minute on each side with a thin coating of olive oil in the skillet. They're great by themselves, but also try these rolled up with a little bit of Daiya cream cheese, olives, & green onion, or in a smokey Vegan mac & cheese. From tom irons of lamar, Colorado on 3/16/2014 . This is a lot better then any pork product out there.Even my picky meat eating son likes these on his breakfast sandwiches.I will be buying these again good taste and better for you a win win in my book. From Anonymous of philadelphia, Pennsylvania on 3/24/2012 . From Lynn R of Glendale, Arizona on 9/29/2010 . I am so excited that I have somewhere to purchase this! The one store I could find in all of the Phoenix area discontinued it. I love this cooked for a sandwich (fried bologna substitute), or in a breakast sandwich, or just plain! I never ate real Canadian bacon so can't compare, but it is good stuff. It freezes well so I can buy a lot to get my money's worth out of the shipping expenses.